Allow me to state the obvious: the BHP course offers a ton of activities. I’ve now taught the course for four years and I’ve developed a select list of favorites. One of these is Lesson 1.0’s Easter Island Mystery. This activity is the perfect hook to begin a 13.8-billion-year journey. Students are often uninterested in history because they think they’ll be learning the same old stuff and memorizing a bunch of facts. By opening with a mystery, students begin to see how scholars use a variety of information from multiple disciplines to construct claims about the past. It also gets them involved in trying to figure out the mystery itself, and they learn that even experts don’t always have definitive answers, and that’s okay! 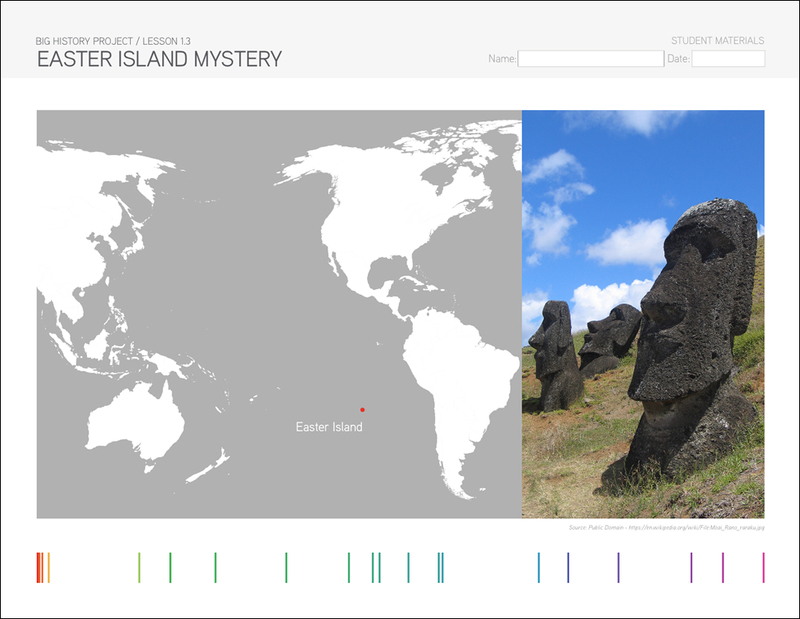 Here at Saint Scholastica Academy, we had our first day of school just a few days ago, and Easter Island Mystery was our first in-class assignment. As I was walking around, monitoring groups, I heard some amazing student hypotheses about what might have happened to the people of Easter Island. Did the population decline due to a war, famine, disease? Their minds were focused and working hard to figure out the mystery. The conversations and questions I overheard while monitoring the groups of students and the palpable level of engagement and energy—there’s no question that this activity had once more helped me overcome that first hurdle of teaching history. These kids now knew they weren’t going to be learning the same old stuff and memorizing a bunch of facts. This was not going to be their parents’ history class. This activity is a keeper!